The game has few severe problems with crowd-control effect stacking, mostly manifesting themselves as enemies starting to act as if they are not affected by anything, despite one or more active CC effects. Paralyze/Petrify after Prone (e.g. cipher's Mental Binding after wizard's Slicken) - without this fix, enemy would stand up and start acting when prone ends, even though paralyze is still active. Petrify after Paralyze (e.g. druid's Embrace the Earth-Talon after cipher's Mental Binding) and some other similar CC interactions - without this fix, if mob is affected by both paralyze and petrify, and paralyze has longer remaining duration, both paralyze and petrify would suppress each other. This is rather scary bug in effect suppression logic, it could probably be reproduced with other affliction pairs too. The whole class of such problems is now fixed. Concurrent Prone and Unconscious (e.g. wizard's Slicken and wizard's Call to Slumber) - without this fix, mob would immediately stand up when second effect hits, regardless of remaining duration. Now any amount of knockback effects stack correctly. Prone after Prone (e.g. 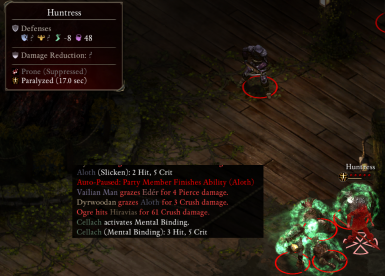 wizard's Slicken cast when previous Slicken didn't expire yet) - without this fix, even though effect duration is extended by the second spell, mob would still get up when first effect would expire. I've seen another bug several times - sometimes enemy would stand idle after Prone expires, until some event happens (e.g. it is hit by an attack). Unfortunately, I didn't manage to find stable steps to reproduce, and thus couldn't track down the cause. It seems to be quite rare (I've seen this once or twice before starting working on this mod, and then few more times while debugging the mod). If you don't have it already, grab Patchwork Launcher and follow User's guide ﻿to set it up. Put AppInfo.dll from the mod next to the launcher executable (if it's already there - this happens if you use other mods - you can skip this). In the launcher UI, select Active Mods -> Add -> select path to the mod DLL. Sources of all my PoE mods can be found on github.